Every four years The America's Cup is held by the current cup champions. For the past three years an army of international sailors have battled each other in a series of regattas for the chance to meet the champion of the America's Cup---Team Alinghi of Switzerland. So what is so remarkable about a bunch of rich, developed countries and several members of the Richest People in the World list throwing their spare change around to fund an elitist sport and these sailing "syndicates," as they are called? The average budget of these syndicates is over $200 million, but is that suprising to anyone when the funders are individuals like software giant Larry Ellison or biotech CEO Ernesto Bertarelli? The answer, of course, is "No." But what is remarkable about the 32nd America's Cup is that for the first time ever in its 100+ year history, one of the challengers is from Africa. South Africa, to be exact. Captain Salvatore Sarno of the Mediterranean Shipping Company (MSC) forged ahead with a dream and a plan, out of which was born Team Shosholoza. Sailing on a fraction of the budget of the other syndicates, Team Shosholoza also fielded the first non-white sailors in this prestigious competition. Currently, the race is on. The warm-up regattas have been sailed over the past three years, all leading up to the Louis Vuitton Cup---which is nearly halfway over. This final bit of this competition (which is almost as long as the ICC Cricket World Cup and comes complete with its own weather delays!) consists of two round robin stages, followed by a semi-final and final. The winner earns the right to meet Bertarelli's Team Alinghi in the America's Cup in June (view the trailer here). After the first round robin stage, Team Shosholoza, despite being green and underfunded, went 5/10 and is in the hunt for a semi-final appearance, although they have left themselves little margin for error. Mechanical problems have been numerous although they have had their share of good luck, too. Out of 11 boats they are lying in 7th and are five points off the pace (a win earns a team two points). As the final round robin stage begins, the South Africans must not lose to any lower-ranking teams, and also must draw blood from those teams in the top four if they wish to advance to the semis. On Monday they are up against bottom dweller Team United Internet Germany. Shosholoza needs every point if they are to stay in contention, and so therefore each and every race is vital to their survival. It is easy to follow the live racing and read all the results and rankings here. If they can dispose of the Germans and gain some confidence, then perhaps they can slay the proverbial giant, Larry Ellison's Team BMW Oracle Racing, who has lost only one race (out of 10) so far. They face the Americans on 1 May. In their first meeting last week, Shosholoza gave the yanks a scare, but in the end BMW Oracle's experience won the day and the race for them. 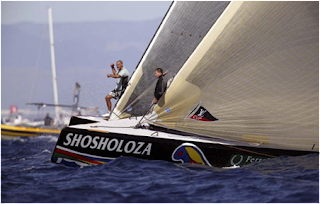 A win on 1 May would leave Shosholoza in a fine spot going into their next races and keep them in the hunt for a coveted (and historical) semi-final place. For a very cool flash animated webpage that explains the roles of each team member on an America's Cup boat, go here. Another day of racing in Round Robin #2 is complete, and Team Shosholoza has kept up their performance to stay in the hunt for a semi-final berth. Fortunately for them, the other players also "cooperated" so that 4th place does not remain too far out of reach. The giant-slaying award for today goes to Team China, the lowest ranked team in the Cup. 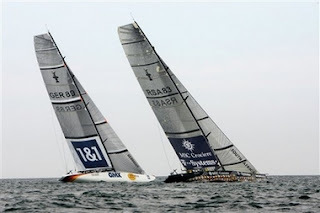 They handed Team BMW Oracle a loss due to two very remarkable incidents. First, BMW Oracle suffered a catastrophic mechanical failure as they blew their head sail. The result can be compared to a runner operating at 75% power instead of his or her full power. Second, and no less remarkable than the first, China Team finished the race. This team was a late entry onto the scene and this has been evident in the Louis Vuitton Cup as they have suffered three "DNS" and a "DNF." So the fact they they were able to finish this race was a massive achievement for them, made even bigger due to the size of their opponent. In the middle of the board the French boat Areva Challenge (8th place) helped Shosholoza by defeating the Italian Mascalzone Capitalia (5th), while the other Italian boat Luna Rossa Challenge (2nd) defeated the Swedish Victory Challenge (6th). Both of these defeats were crucial for Shosholoza as Mascalzone Capitalia and Victory Challenge currently occupy 5th and 6th places above Shosholoza's 7th. Visit the America's Cup homepage for the complete ranking and racing schedule. Well, it's come and gone, with no lack of irony that the only thing shortened in the whole tournament was its showpiece match, and even that went down kicking and screaming, not so gently into the night. For a great read on the ICC and its administrative bunglings, check out this article in CricInfo.org. But the best team won in the end, and there'll be more analysis to follow, once the bitter taste has subsided. Bring on the IAAF Track and Field season! An inferiority complex about Australia and sport is something uniquely South African (and perhaps Kiwi, too). In the light of a team that yesterday won its third successive Cricket World Cup, to go along with its multitude of other sporting triumphs, this article analyses why the Australians are so good at sport. Perhaps we can learn from them? Australia was one nation that suffered as a result of the GDR success. Thus at the 1976 Montreal Olympic Games, Australian athletes won only 5 medals of which none was gold. Since the Australian national identity is based, in part, on a belief of superior athleticism – the bronzed Aussie battler overcoming all athletic obstacles in a hostile world – this was a threat too perilous to ignore. A state of national emergency was declared and the nation's top sporting administrators convened to plan a way forward. By 1980 a proposed blueprint for future success had been accepted; the government committed to provide long term funding to establish a national centre of excellence - the Australian Institute of Sport (AIS) – to be built in the nation's capital, Canberra, close to the seat of government. There the nation's best coaches and athletes representing those identified sports at which Australians might reasonably be expected to become future world leaders, would be housed. They would be provided with the medical, scientific and technological support necessary to insure that they became the best in the world. A nationwide sporting talent identification program was initiated so that most Australian school children are now screened for sporting talent whilst still at school. The mission of the AIS became to provide a “world class training environment to support AIS athletes and coaches”. Bradman, the greatest cricketer of all time by some margin, came to prominence at a critical time in Australian history when the nation was financially strapped as a result of the First World War and the Depression and at the financial mercy of the United Kingdom. There was also the memory of the Battle of Gallipoli at which, according to the Australian interpretation, the Aussie troops were sent to their death by an indifferent English commander. In this period of great national misery, almost the sole ray of hope was Bradman’s consistency in repeatedly scoring centuries seemingly every time he went to bat and his ability to inspire Australian cricketing victories over the distrusted English. With the exception of a few aberrant periods, Australians have always been at or close to the top of international cricket, most especially in the past 15 years. Yet Australian cricket is not a core feature of the AIS programme and has developed its own systems for success. Finally there is the perception that Australian cricketers never give up – an ingrained attitude that antedates the influence even of Sir Don Bradman. There are clearly important lessons for South African cricket in this example. 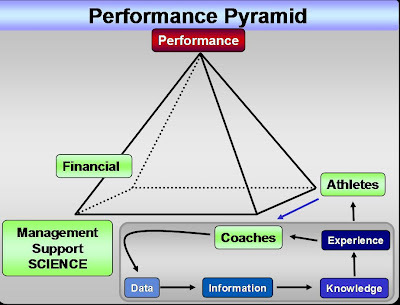 It has often been said that in order to improve sporting performance, one needs to focus on the bottom level of the performance triangle rather than at the peak. The rationale for this approach is sound, and it should be obvious to all concerned that the continued and sustained long term improvements of our on-field sporting performances depend on the identification, selection and then management of talent, which can only be achieved through mass participation at the junior level. There is no better example of this principle than that of the Chinese Sporting system, who, backed by government and access to the largest population in the world, have established an astonishing 1,782 sports schools catering for 185,000 athletes! Their projections are that 10% of these athletes will ascend the ‘triangle’ to the elite level, giving them enviable access to 20 000 potentially elite, medal-winning athletes at the 2008 Olympic Games! South Africa cannot hope to compete with these numbers, and so simply trying to mimic this model is a futile effort. Thus, while mass participation is essential and must be encouraged, it is the proper and specific ‘farming’ of that talent that will make the ultimate difference to South African sporting fortunes. To use an analogy from the agricultural industry, one can attempt to turn the entire country into arable land, but if the crops are not fertilized, watered and harvested at the right time, 99% will go to waste. Similarly, the entire country can (and should) participate in some sport, as this dramatically improves the chances of discovering another Ernie Els, Makhaya Ntini, or Kabamba Floors, but in the absence of adequate talent identification, coaching and management, talent will slip through the cracks. Mass participation merely increases the chances of discovering talent, but it does not proactively bring it through. Upon reflection, the strength of the Chinese sports programme is not the 200 000 athletes at various levels in sports schools, it is the astonishing 20 000 qualified coaches who have been trained to develop that talent, to grow and harvest it to produce Olympic medals. At its most basic then, a successful sporting system is one which ensures that the best athletes are in contact with the best coaches. It is simple as that. There are therefore two variables that must be addressed – the athletes and the coaches. Unfortunately, there is a third variable – administration or management – which all too often dominates the headlines of SA sport and wedges itself between the other two, but this is another matter, for discussion in another article. Returning to the coaches and athletes, South Africa needs to ask: “Do we have the athletes?”, and secondly “Do we have the coaches?” The first question has been extensively debated, discussed and argued. We can point to our success at the junior level, the strength of our school sports and the occasional moment of sporting brilliance to suggest that we DO HAVE THE TALENT. The coaching, however, is another matter. South Africa, to date, has no centralized coaching accreditation body. There is no single entity that has successfully implemented a system for coach education and monitoring. As a result, there is no systematic method for identifying talent, coaching that talent and then managing it at the high performance level. At this stage, it is essential to point out that coaches must fulfil different roles at different levels of the so-called performance pyramid. At the mass participation level, it is the role of coaches (supported by administrators) to teach basic skills, to create interest in sport and to give opportunities to all to play sport. As one moves further up the pyramid, the role of the coach becomes more specialized, and specialist position (defensive, attacking) or functional coaches (batting, bowling, fielding) must be trained and employed. The specific role of coaches in an ideal sporting system will be described in a future article. The biggest problem facing sport in South Africa, then, is a lack of cohesion among the different levels, which results in failure to move talent through the system. In my opinion, the ideal sporting system can be represented as a pyramid, with four corners at the base. This is represented by the figure below. At the base are the Coaches and athletes, already described. We now introduce two new components - Financial support, and Management. It is with Management that I have included the essential role of sports science – without exception, the successful sporting nations have managed to implement scientific principles into the preparation of their athletes, and South Africa must do the same. If these four corners are present, then coaches will work together with sports scientists and managers to gather data, which is then converted, ultimately, to experience, which is passed onto the athletes with whom those coaches work. It is the cohesion and continuity provided by this system that will ensure growth in the system – in otherwords, all coaches will ultimately adhere to what has been established as ‘best practice’ for every given athlete. Finally, it is my observation that there is no obvious link between success at the elite level and mass participation within the school system. Therefore, Australia, with its excellent elite sports system, still has one of the highest obesity growth rates in the world, with more children being completely inactive than ever before. Similarly, countries who have successfully implemented mass participation programmes do not necessarily go on to produce world class sporting performance. The key ingredient? In my opinion, coaching, which takes talent through a process that ultimately reaches the top of the pyramid (Figure), producing medals. In subsequent articles, I will address the ideal sporting system and the role of coaches at each level, as well as the vital role of management and administration in ensuring that the pyramid can stand. Check out this article on Zhou Chunxiu after her victory in the London Marathon. It talks about her weekly training distance, a staggering 300 km a week! That is effectively one marathon a day, no rest! She says it's broken up into two sessions a day, covering about 50 km in total. One wonders how much influence the famous turtle blood has on her ability to sustain such high mileage, because physiologically, it is almost impossible. Of course, there are exceptions, and in a nation of a billion people, it's not impossible that one would be able to handle this. But, given the history and the legacy left by the Chinese women of the early 1990's, I'm sceptical. Right, so we're halfway through the CWC final, with Australia making 281-4, thanks to Adam Gilchrist's brilliant 149 off only 104 balls - the highest score ever in a World Cup Final, and fastest 100 to boot. The first 10 overs were steady, only 46 (Australia's lowest score off 10 this whole tournament), but between 10 and 20, they were unstoppable - 91 runs scored, and it wasn't even a Power Play. I must admit (somewhat sheepishly) that I had been thinking that perhaps the time was right for Gilchrist to retire, he hasn't been the dominant force he used to be. It's often appeared to me that he's not been hungry to keep going, and as a result, was making a lot of 20's and 30's, never going on to make huge 100's. But I guess what better occasion to be hungry than a world cup final? And he rode his luck, but what a great innings. Match-winning? I think so, it will take a phenomenal innings from someone to beat that. And Sri Lanka's problem is that they have a lot of run-a-ball scramblers in the middle of the order, and that won't be good enough. So it's up the 163-year old Sanath Jayasuria to take them there. Let's hope it's exciting, but I have a feeling the game's gone already. I call Sri Lanka to reach about 220 for 7 by the time that fat lady sings. So rain has delayed the start of the CWC Final. Let's hope they get 50 Overs a side in. But wouldn't it be ironic that a 7-week tournament comes to and end with a final that has to be shortened because of rain? So I see that Ponting has won the toss, and Australia will bat - so our prediction from earlier can be filtered - Australia to win by 60 runs! The eternal Cricket World Cup (all 7 weeks of it) comes to an end tomorrow when Australia take on Sri Lanka, drawing the curtain on what must be the longest tournament in sports history. Cricket, once called "Baseball on tranquilizers" by Robin Williams, has done little to change its image in the last 7 weeks (can anyone name the two teams who played in the first match?). But before the curtain draws, we have one more game, one more chance to rescue a tournament drowning in mediocrity. Australia, who have steam-rollered all before them, take on Sri Lanka, who, out of the only eight teams who can really claim to be a cricket nation, have looked most likely to upset the canary yellow juggernaut. Much depends on the toss of a coin, and with the Barbados pitch known to favour seam bowling, Australia appear to have the upper hand (if they didn't already), especially if they bowl first in seamer friendly conditions. This is however doing a disservice to Chaminda Vaas, one of the canniest and most skillful bowlers around. Then of course there is Lasith Malinga, whose hairstyle is only marginally more unusual than his bowling action. I wince every time he enters his delivery stride, for the biomechanics of his bowling action appear to defy the laws of physics. Judging from the way the New Zealand top order played him in their semi-final, it appears that the ball he releases also defies the normal laws of motion. And facing up to these two Sri Lankans will be Matthew Hayden, who has been majestic this tournament. South Africa tried (and failed) to imitate his approach to batting, though their blind courage and machoism was embarassing when contrasted with his brutal elegance and control. Hayden has demolished every one he has come up against, and if tomorrow's game follows that pattern, with the likes of Ponting, Clarke, Symonds and Hussey (he is playing in this tournament, isn't he?) chipping in, then the four-pronged Australian attack, three of whom sit in the top 4 wicket takers of the tournament, will not even be called into action. Nor will Muttiah Muralitharan play a significant role in the greater context of the game. For if Hayden has his day, Murali will be bowling inside the first 20 overs, with 130 on the board. And even a return of 2 for 30 from 10 will not prevent Australia from reaching 390. And with their bowling, that will be a mighty difficult task. So much depends on the toss, and much depends on who gets the upper hand in the early exchanges. Ultimately, however, the problem for Sri Lanka is that they are going up against too much firepower. The above scenario is worst case - Hayden fires, Gilchrist finally comes good, Ponting and Co. chip in, and it's a landslide. But even if Hayden fails, it seems there are still too many weapons later on. Sri Lanka, on the other hand, rely on perhaps four key players, and though the team has collective strength, it will ultimately be overwhelmed by collective dominance from Australia. Our call - if Aus bats first, they win by 60 runs. If they bowl first, win by 5 wickets.